Hawaii’s landscapes and seascapes have always been major selling points for Hawaii’s tourism industry. However, the subtleties of the moods of Hawaii skies often go unnoticed by visitors. Until they get here. Impossibly florid images of lush rainforests and pristine beaches have attracted curious visitors to Hawaii since before Mark Twain wrote about the islands after a four-month stay back in 1866. Hawaii’s natural beauty is easily conveyed in words and images. Hawaii’s beauty begs superlatives. They may be overused, but they remain accurate. Most familiar are images of puffy white clouds against a bleachy-blue sky or towering waterfalls. Blue waters and sandy beaches are what most people associate with Hawaii. But once you’re here, you’ll likely notice that Hawaii’s skies have moods and visual textures of their own that can’t be conveyed through visual media. In a place that enjoys year-round sunshine, it’s easy to forget that Hawaii does have actual weather. 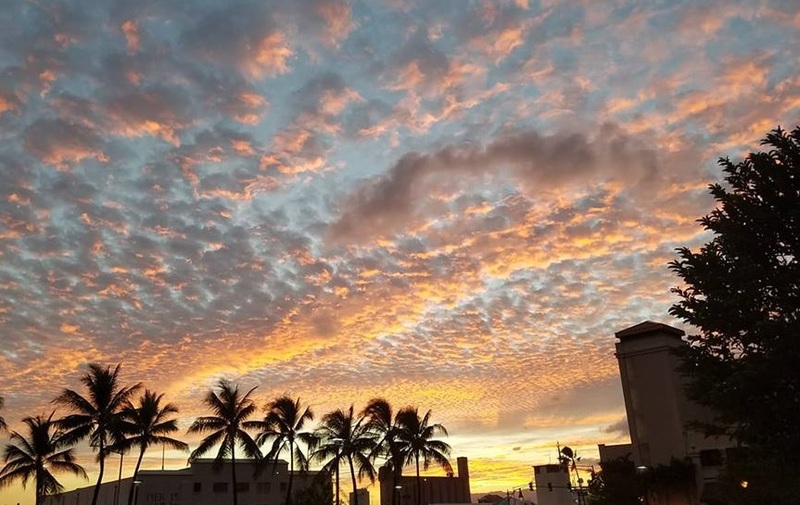 Depending literally on which way the wind blows, Hawaii’s skies sometimes surprise even lifelong residents with their splendor. 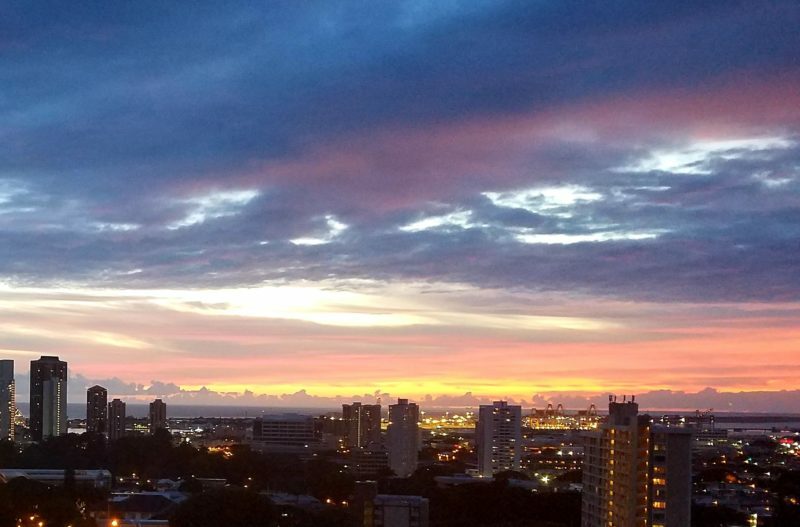 A Honolulu sky at dusk. A passing weather front can turn a sunrise into a brooding prelude to a gloomy day or a glorious welcome to a sun-drenched afternoon on a white sandy beach. The sun may beat down mercilessly at high noon or it might hide, shrouded in a murky gray brought in by balmy Kona winds from the south. 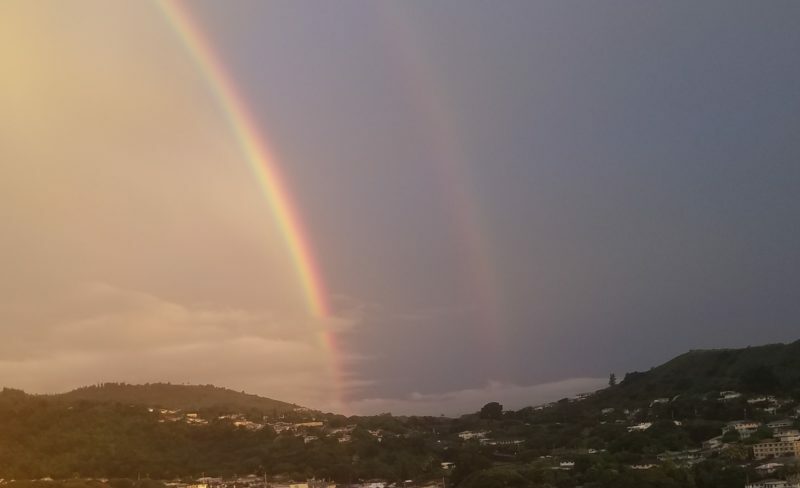 When Hawaii skies make even kama’aina who grew up under them stop and take notice, social media is consistently flooded with images of double rainbows or magical cloud formations. Facebook lights up with images of sweeping wisps of clouds that look like sails in the freshening breeze. Instagram presents billowing pillows over the mountains at sunset swelling with orange and purple, seemingly close enough to reach out and touch. Other times, surly skies dominate during passing tropical disturbances. Rather than the familiar pastiche of blue skies and torrid sunsets, Hawaii skies present a flat and sullen slate of gray as rain drizzles down. Stubborn stews of moisture sulk deep in fetid valleys. On normal weather days, cumulus clouds glow purple and pink at sundown, smoldering until dark. Drama in the Hawaii skies. The light show doesn’t end at sunset. Hawaii’s skies light up at night, too. A misting rain will paint a luminous halo around the moon. Away from the light pollution of densely populated areas, the stars twinkle and dance as lazy low clouds wander by, pushed by busy trade winds. Yearly meteor showers like the Perseids and Leonids streak the skies for nights on end. In Hawaii, all you need to do to find its beauty is look around you. Hawaii’s people and places are unique in all the world. It’s beauty and aloha spirit are everywhere. As you look around, don’t forget to look up.